1995 - The Trouble With WATERWORLD | Warped Factor - Words in the Key of Geek. Si Shepherd takes a dip in the troubled Waterworld. With all the troubles surrounding the production of Waterworld it is testament to Kevin Costner that it turned out as good as it did. That's right, I said good. I'm probably splitting the audience down the middle here because chances are if you've seen Waterworld then you'll know it's a good movie with a lot going for it. I'm not saying it's not the best in the world, but it's a very enjoyable 2+ hours, and well worth watching. However, so many people listened to all the negativity surrounding the film upon release 19 years ago that I'm constantly surprised by those that haven't given it a chance, those that think it's a flop...those that think it's a stinker. 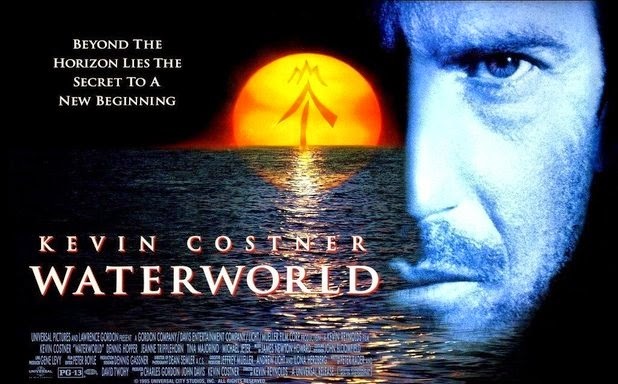 Originally Waterworld was given a budget of $100million. Let's put that in some perspective, when pre-production began Jurassic Park was in cinemas, an amazing movie with costly special effects. It cost $63million! So Universal clearly had huge faith in both Kevin Costner and director Kevin Reynolds. But making a movie at sea, in an artificial seawater enclosure near Hawaii, pretty much automatically doubles the cost of everything, from insurance to catering and all that's in between. Then there's the weather, which is always a lot worse offshore. A hurricane destroyed sets worth millions of dollars. So with the shoot already massively running over schedule, Universal ended up forking out an additional $75million to complete the picture. They really had no choice. Do you walk away $100million down and not even half a movie completed? Or do you at least finish the film regardless of the cost and hope to get the money back? It was a really a no-win situation there. When the news leaked early that the production was in financial trouble the press quickly jumped upon it, comparing the not yet completed movie to the expensive Warren Beatty/Dustin Hoffman flop Ishtar, by calling it 'Fishtar'. A lot of this came of the back of Kevin Costner's runaway success in the early 90s with movies like The Bodyguard and Robin Hood: Prince of Thieves (also directed by Reynolds). Boy, how the press likes to tear people down when they become successful, this was the chink in Costner's armor that they needed. But the financial difficulties we're just one small part of the on set troubles, most remained unknown until after the movies release. Kevin Costner nearly died when an unexpected wind current capsized his trimaran during the filming of a scene where he was tied to the mast. Delays were needed for the stars recovery. Costner’s stunt double, Laird Hamilton, would travel to the set via jet ski. One day he ran out of fuel and drifted out to sea, and became officially 'lost at sea' for hours until finally rescued by the Coast Guard. A terrible situation that could of ended so much worse, but just happened to take place on the only clear day for about a fortnight. So no filming took place and more delays. On another day stunt coordinator Norman Howell suffered from decompression sickness while setting up the filming for an underwater scene. He was rushed to a hospital and the set was shut down until he recovered. Nine year old Tina Majorino, who played Enola, was nicknamed "Jellyfish Candy" by Kevin Costner, after she was stung by jellyfish on three separate occasions during filming! Costner and Reynolds had worked together previously on three other films (Robin Hood: Prince of Thieves, Fandango, and Rapa Nui), and were considered to have a very strong working relationship. That was until Reynolds left the production with approximately a third of the movie still to shoot. Rumours suggest that Costner, in his role of producer, fired him. Other stories state that Reynolds had just had enough and quit on his on accord. Either way the pair did not reunite again until 2012 for the television mini-series Hatfields & McCoys. This left Costner to complete the movie himself, and also oversee some script re-writes to inject new ideas he had. Joss Whedon was the man who Costner bought in for this task. He was flown out to Hawaii, right to the set, and later described the experience as "seven weeks of hell". In the end, Costner was on the set, both filming and acting, for 157 days, working 6 days a week. A massive overrun from the original schedule, almost double. Once the film was finally in the can Costner made many additional changes to Reynolds vision in the editing suite. Mark Isham had been tasked with writing the score, but Costner rejected it because he felt it was "too ethnic and bleak". Isham was paid off and James Newton Howard was brought in to write a new score under Costner's direction. When Waterworld was finally released on 28th July 1985 it opened as the most expensive movie ever made (A mantle Titanic took from it two years later - guess why? Filming at sea! ), and to largely positive reviews from the respected movie critics of the day. But the damage had been done thanks to months of tabloid speculation. Waterworld took just $88million in the US. However, it did break even thanks to a $264million worldwide gross and a very successful home video release, where it became something of a cult classic. So much so there were rumours recently of SyFy producing a kind of remake television series. I hope they've got a big chequebook!